I cooked this for dinner last night to use up some veggies. Some people asked me for the recipe. Um... here's the thing. I don't really DO recipes. I'm bad about that. I just, you know.. bake. Or cook. I grab leftover spices and crap in my kitchen and make food so I don't have to drag my booty to the store! That being said, here is my best recreation of what I did, for those that want to make it. Cook some whole wheat pasta. Set it to the side. Saute some firm tofu, set that to the side. Scoop out a HUGE spoon full of creamy peanut butter, and toss that in with your veggie broth. Stir it until it dissolves. Squeeze some lime juice in. Toss in a crushed clove or two of garlic. Let everything simmer until the water from the broth cooks down. Sprinkle on a little pepper for some kick. There. 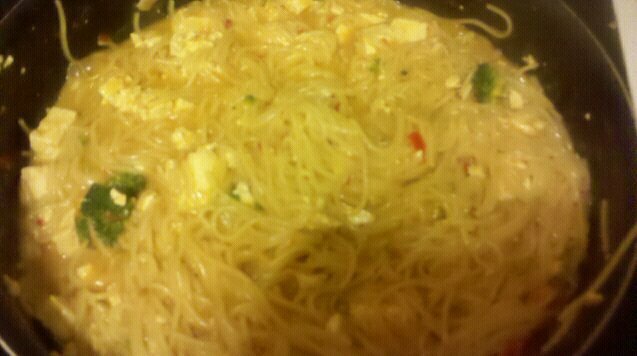 That is my non recipe for the spicy noodle tofu THING I cooked last night!